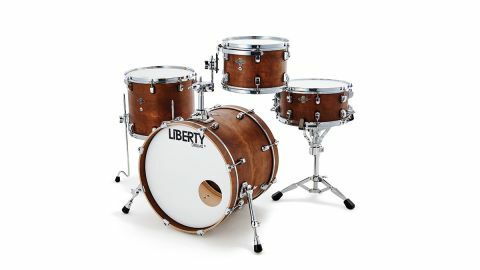 A perfect example of the beautifully crafted drums that we have come to expect from Liberty. The Richmond not only offers an abundance of tone but also a surprising amount of low-end. Supreme build quality and tone. Single-ply heads might be more suitable for jazzers. County Durham-based Liberty Drums is celebrating its 10-year anniversary this year, since establishing in 2006. The British boutique company led by founder and CEO Andrew Street has gone from strength to strength over the years, now gathering serious momentum both in the UK and across the pond. Despite this rise to international status, the company plans to stay true to its roots and limit production of its drum kits and snare drums to a modest amount in order to maintain that 'special something' about the brand. Liberty offers a selection of shell packs including the Exotic series, Avant series and Jazz/Bop series. The real magic however, starts with the custom-build drum kits and snares, now also available to order online using Liberty's new custom kit builder. The brand new Richmond series is available in a selection of configurations which are all, naturally, largely customisable. In fact, the kit we have acquired for review has itself had a few special tweaks here and there. Interestingly, we have intercepted it whilst en route to its new owner, none other than the man behind Cymbomute, Mr Hugh Lawrence. Let's hope he doesn't mind us christening it for him! There are four main shell-packs on offer which vary slightly based on the selection of kick-drum size. These sizes are 18"x14", 20"x16" (as review), 22"x16" or 24"x16". Each includes a 12"x8" rack tom and 15" floor tom which is 13" deep when accompanying the smaller kick-drum sizes, or 14" for anything over a 22". Each shell pack is also available as a four-piece to include the matching snare drum. Ours is the 14"x7" but there is also a 51⁄2" or 61⁄2" depth option. To give you an idea of price, The Richmond 20, like our review kit, as a three-piece would set you back just over £1,500, while the addition of the snare drum takes up to just over £2,000. "The natural finish of the "rustic whisky brown stain with clear satin hard wax" is absolutely stunning." The Richmond is designed using a 'vintage construction method' which means very thin shells (with the incorporation of reinforcement rings) and full-contact bearing edges. The review kit features all birch shells; 3.5mm/7-ply for the toms and snare (with 9-ply re-rings) and 6.5mm/12-ply for the bass drum. The bass drum is drilled and comes supplied with a single ball-joint tom-mount which also features quite an old-school style cymbal clamp. There is also the option of having an un-drilled bass drum which allows for the shell to be an even thinner 5mm with the addition of 3mm reinforcement rings. The natural finish of the "rustic whisky brown stain with clear satin hard wax" is absolutely stunning. This rich dark colour of the shells enhances the beautiful birch woodgrain and looks terrifically smart with its adorning chrome hardware. The kit features 2.3mm triple-flange hoops and Liberty's chunky signature die-cast beetle lugs (also available in black nickel). Each drum also exhibits a black and chrome coloured Liberty badge which features the company motto, "To build and excel. To inspire and enhance." Judging by the impeccable level of visible build quality, excel themselves they certainly have. is available outside the advertised specification. For those that aren't familiar, this is a seriously fancy piece of engineering that allows the snare wires to be easily clicked into four different positions (including off) with absolute ease and very little noise. The kit is supplied with premium Evans heads as standard. The chosen skins for the toms are clear EC2 batters and clear G1 resonants, coated ST Dry batter and snare-side 300 reso for the snare drum and a clear EMAD batter for the bass drum. The resonant side is a bit of a mystery although we'd safely wager that it's also an Evans. The gloss white head features the Liberty logo in black and came pre-cut with a 5" port. With an air of caution (considering our review kit has already been purchased), we take the kit along to a couple of relatively tame gigs in order to put it through its paces. First off, we find it to be fairly light-weight due to the thin shells yet still have a reassuringly sturdy feel to it, helped most likely by the weight of the beefy die-cast beetle lugs and of course the internal reinforcement rings. The included hardware such as the tom mount and suspension system, bass drum spurs and quirky curved floor tom legs is all fairly heavy duty and assists with the overall solid feel of the kit. With the bass drum being the first component of the kit set up as usual, a cursory flick of the pedal produces a surprisingly low and boomy note. With the drum tuned quite slack to begin with, the note produced is shorter and dryer compared to the gloriously low and more sustained 'whoomph' that comes as a result of a little more tension on both batter and resonant sides. "From a whisper of a ghost note to a full-on backbeat, the snare response is thick and ever present." This is undoubtedly accentuated by the Evans EMAD batter head which is notorious for working magic on bass drums. This 20" kick clearly has a wide tuning range and sounds positively meaty throughout the gig. Moving on to the unusually sized 15" floor tom, designed to create a middle ground between the commonly used 14" or 16" offerings - we are instantly sold on the idea as soon as we play it. Easier to tune, like a 14", and with a little more roundness to the tone whilst still offering a shuddering low-end boom. Not quite as fat as a 16" but with less 'slap' than you might expect from a larger drum. The interval between the 12" rack tom and 15" floor tom is well suited and both are wonderfully easy to tune in both low and higher ranges. The supplied Evans EC2 heads complement the birch shells well but we would have been very intrigued to get some single-ply coated heads on them for some jazzier action. Considering the lively resonance of the shells, we're fairly convinced they would lend themselves rather well to it. Finally, the 14"x7" snare drum. Having the potential to be very lively around the edges, the centre is really quite controlled and has a dryness to it. Partly due to the supplied ST Dry head (the clue is in the name) but also thanks to the delicate sensitivity of the snare wires. From a whisper of a ghost note to a full-on backbeat, the snare response is thick and ever present.